I gave a talk on Friday to a local group, and today received a lovely card. “Thank you so much for coming to talk to our group yesterday. 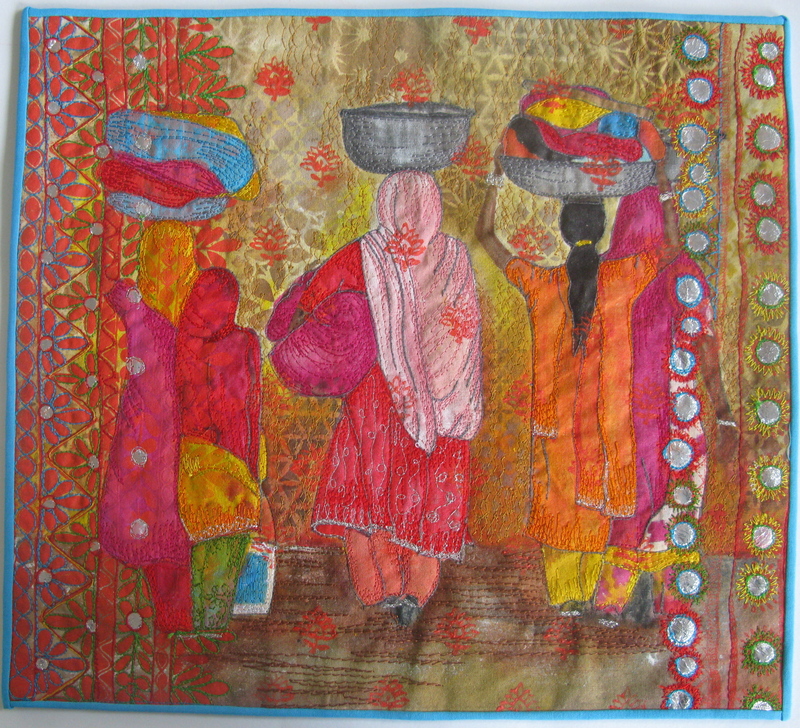 Your photos are such a riot of colour and so evocative of India. How great that you could provide work for a co-operative and instill the need for quality control and high expectations. Your talent is simply amazing! 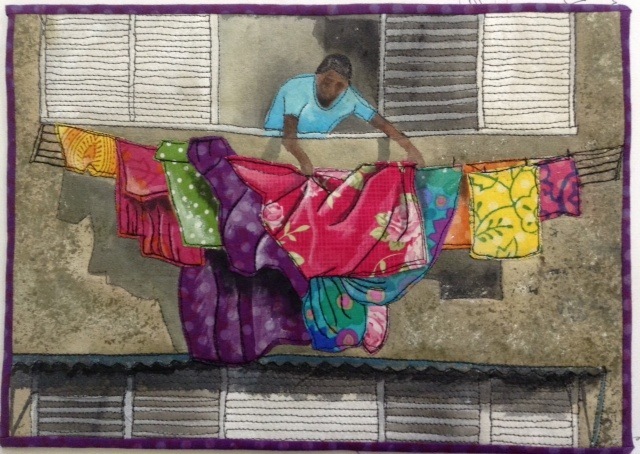 Thank you also for bringing examples of your quilting. What beautiful reminders of your travels. We really enjoyed your visit. It always seems to take ages to get everything ready for giving a talk, but when you receive thanks like this – they are worth doing. With a very busy October coming up I wanted to get ahead with my Journal Quilts, not something i have ever done before! Here is another JQ based on Swedish Textiles. It is stitched with Bermilana thread, woolly and can be tricky to use. I love using it as ican look like it has been hand stitched. I used some braid that I bought in Sweden and some buttons I was given, and dyed the wool felt. 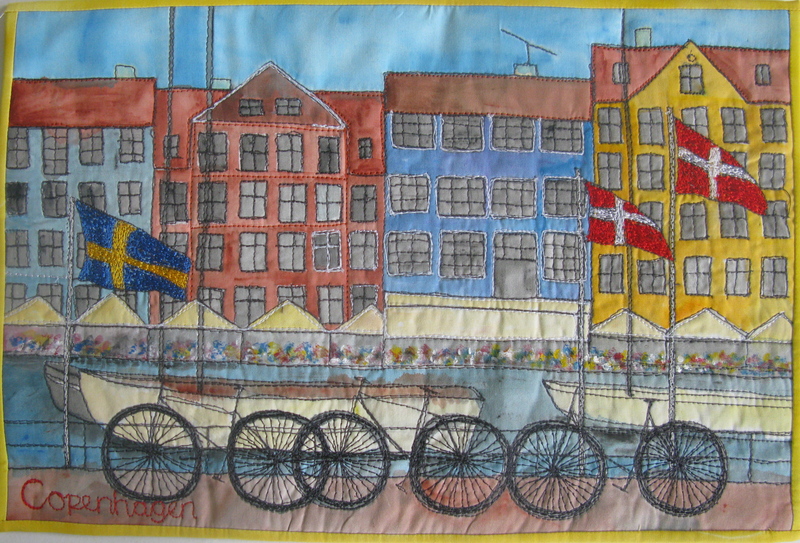 I had another look at my Copenhagen piece and decided I needed to make the bicycles more prominent so stitched a bit of colour on them. Looks better now. 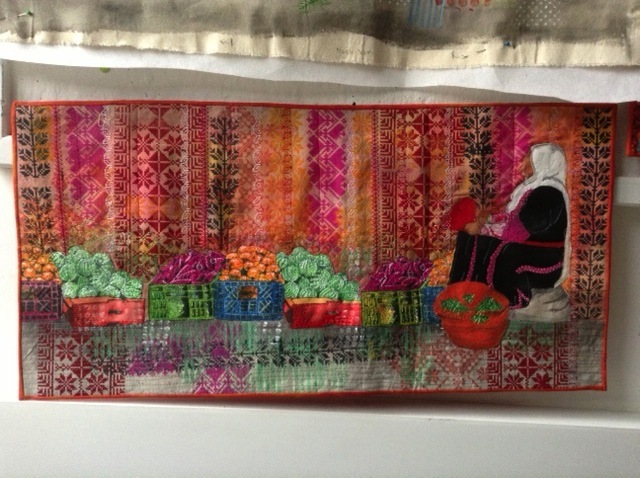 Here is an example of the finished small wall hanging, table runner. 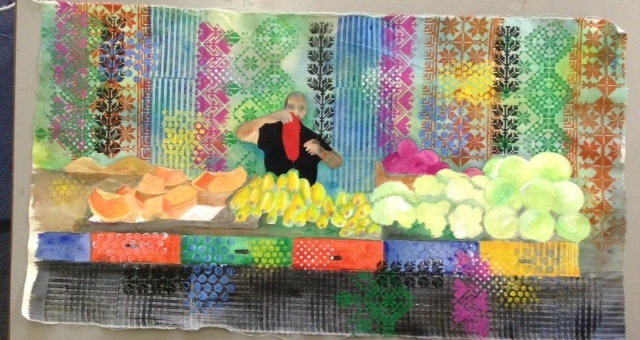 i decided to work on my Out of The Kitchen rejected piece just to get it finished. 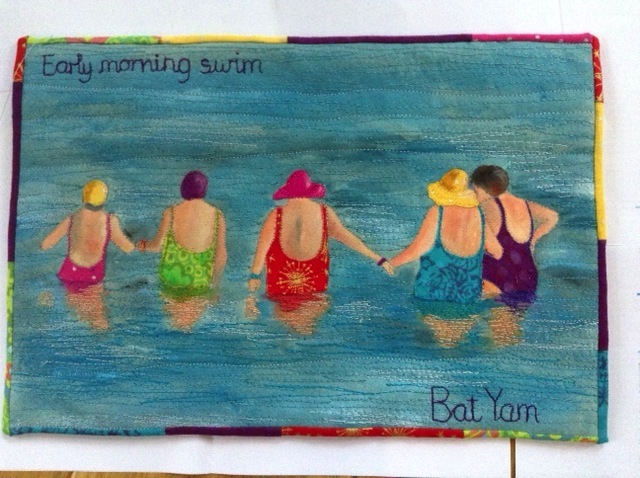 Today i have had a visit from a fellow Textile artist from Melbourne Australia. We have been working on an idea of hers. My Palestinian quilt is almost finished but I have an idea to put an extra piece on the side of it. Watch this space! 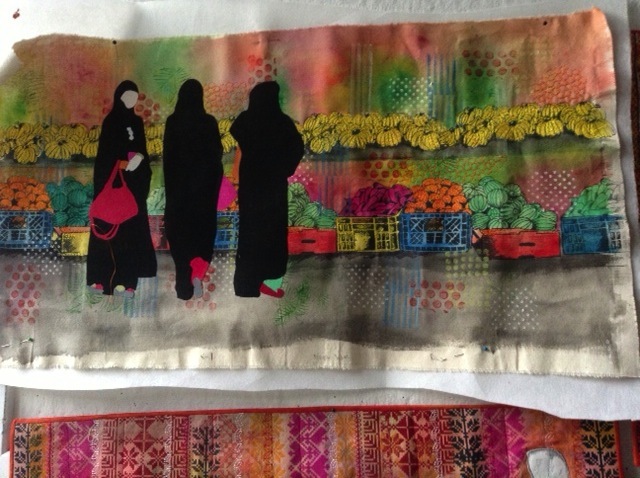 I entered the project “Out of the Kitchen” – a project to work with Afganistani women, anyway my piece was rejected on the grounds that I had done too much work on the piece and there wasn’t enough space for the women to do any work. 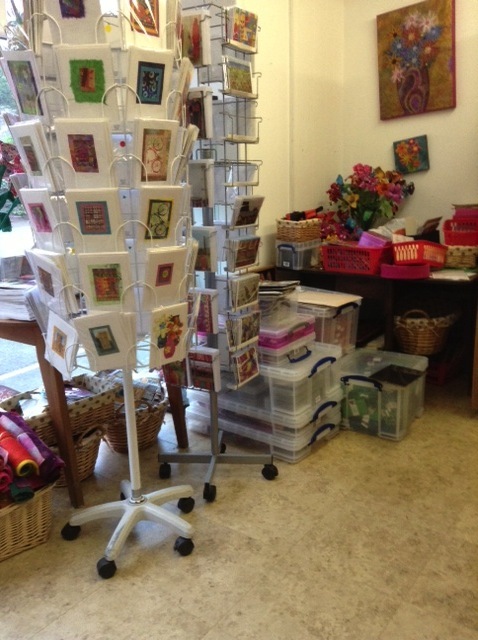 I finally have my online shop up and running and have had a few orders today. it took a bit of doing and I had, in the end, to have ask for some help from my son. I have been working on the A3 piece for the CQ suitcase collection and produced a piece that I chopped down so it is only A4, so it means I will have to do another but that’s ok – this is only a practice piece. I have finished the first, almost finished the second and done all the background for the third. 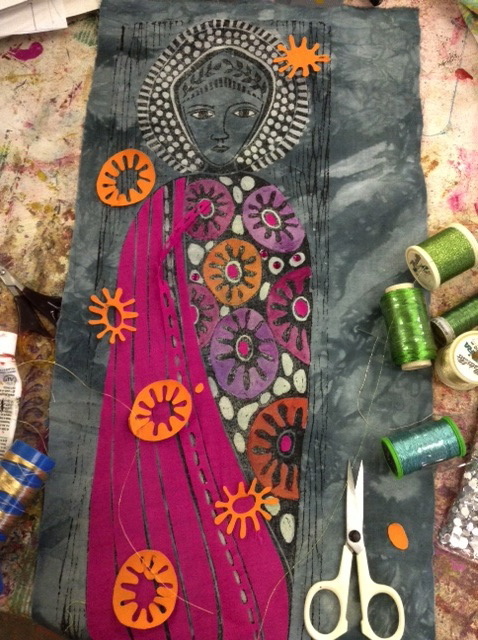 I was asked by my friend Dijanne to stitch a piece of work intended for an exhibition in Italy. Dijanne has printed the background and all I needed to do was stitch it! It was good to do a piece that just required stitch rather than designing. I know that today I should have spent the day learning how to put my Flower its and books on the paypal part of my website but there were things I preferred to do. I finished one of the 30x60cm pieces for another group called Contemporary Horizons. Here is the second one of the series – not sure about these yet. I just need to have them pinned up on my board in my studio. 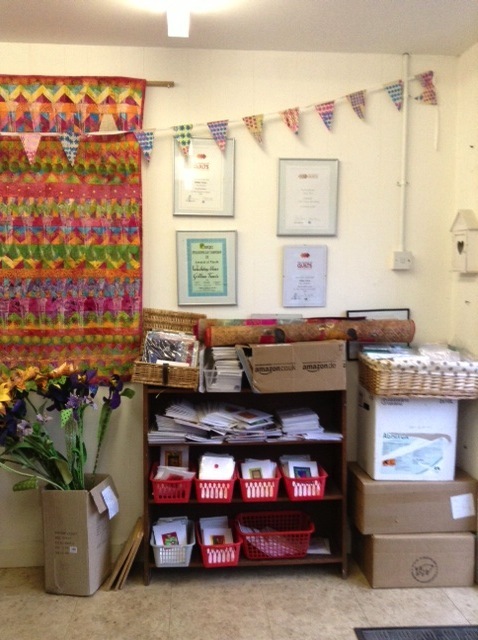 I spend most of the weekend tidying both the front of my studio and the back. All the photos have come down! They kept on dropping off so the walls are blank, apart from where the blu-tac wont come off.